Our raw puppy food is deemed to be one of the best available in the UK. Like our adult dog food, our raw dog food created for puppies is lovingly made with UK sourced, high quality, human grade ingredients. Raw and natural feeding is the perfect way to start a puppy’s life, both small and large breeds of dog do exceptionally well. We aim to grow puppies at a slow and steady rate, supporting growth but not putting excess weight and impact on their young bones and joints. Our raw mince is packed full of nutrients and offer optimum nutrition, providing everything that is required to nourish the body and developing organs, digestive and nervous systems and maintain a healthy immune system. Sadly, we see young puppies with skin, coat and digestive disorders, raw food however is particularly hypoallergenic which can help with the relief of some of these symptoms. Breeders can begin to wean young puppies; three to four weeks old onto the Wolf Tucker weaning paste, available in two flavours and just perfect for tiny mouths. 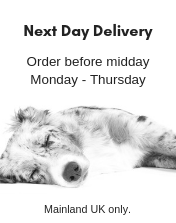 We offer a complete range of raw meals and proteins that support the development of the older puppy, available in four palatable and wholesome varieties.